I recently learned something interesting from my neighbor Tracy, who is the mother of one of the dog walkers. I was interviewing her for my column about how she teaches her kids (ages 9 and 14) about money. She said her son, Jake, came to her and asked for a video game that was “only fifty dollars.” She explained to him that some people have to work really hard for the money to buy a game like that – maybe for five hours or more. Tracy knew he didn’t understand what five hours of work meant, so, she showed him. 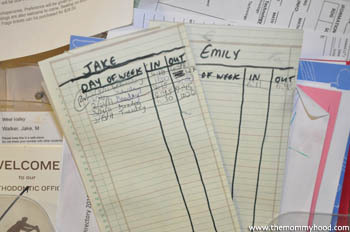 She made time sheets for each of her kids and had them clock in and out when they did their chores to teach them about working hard and earning money for things they want. This is the same woman whose nine-year-old started a dog walking business, so I think this is a pretty good indication she knows what she’s doing – with her kids at least. I know every kid is different, but this is defintely something I am filing away for future use. 14 feels light years away now, but I know I am going to blink at it will be here. So, I continue to pay attention and learn from the moms who are farther down the road, knowing I will eventually be there, too.